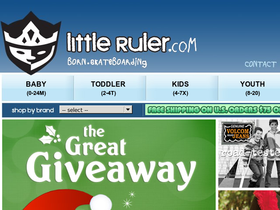 Shop Little Ruler online at LittleRuler.com for all the cool clothes your young kids want to be wearing. LittleRuler.com utilizes soft premium cotton, and 50/50 blends for their outerwear. LittleRuler.com offers a wide range of tees, onesies, jackets, shoes and headwear. Save on your next purchase from LittleRuler.com with LittleRuler.com discounts, LittleRuler.com coupons, LittleRuer.com promotions and LittleRuler.com savings found here on 58coupons.com. Get on over to Little Ruler to save 10% on Volcom backpacks with this coupon code. Enjoy free shipping from Little Ruler on orders over $75 or more with this coupon code. Get on over to Little Ruler to save 10% on Roxy backpacks and lunchpacks with this coupon code. Head on over to Little Ruler to save 10% on Quiksilver backpacks and lunchpacks with this coupon code. Hurry on over to Little Ruler to save 10% on O’Neill backpacks with this coupon code. Hurry on over to LittleRuler.com to save 50 - 70% off on select items. Click link. Head on over to Little Ruler to purchase select T-Shirts at only $11. These won't last long. Click link to view. Rush on over to LittleRuler.com to save a bunch on t-shirts, onesies, flip flops, beanies, shoes, caps and much more. Click link to view. Get on over to Little Ruler today to enter their contest to win $100 prize package. Click link for details.